Dons boss Karl Robinson admitted shedding tears after hearing loan star George Williams would be out for six months with an anterior cruciate ligament rupture. 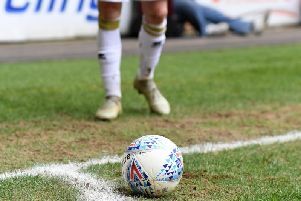 The 19-year-old on loan from Fulham suffered the injury in the 2-1 defeat against Chesterfield at stadium:mk last Tuesday night, and had successful reconstructive surgery on his knee on Saturday. Williams was at the start of his second spell at MK Dons, having teamed up with his former club to help them in the promotion battle for the rest of the season. After hearing the severity of the injury, Robinson admitted it was the hardest hour of his managerial career. “It is probably the most difficult hour I’ve had as a manager,” he said. “The kid means so much to me as a person and I rate him so highly as a footballer. “To see someone you like in so much pain, and not know what to do... I went home and had a cry to myself. I couldn’t handle it. I can handle defeats and all number of things with this job, but when it comes down to a kid’s career, it’s so difficult to accept. “It just doesn’t seem fair. I’m so disappointed. From a selfish point of view, I thought I’d found the missing ingredient. We were so excited.